Coming back fresh from GDC, I thought I would do a rapid follow-up using the Media Monitor and see how well the event performed with regards to the prevalent topics in media coverage. And when I say fresh, I mean seriously jet lagged, but that’s beside the point. 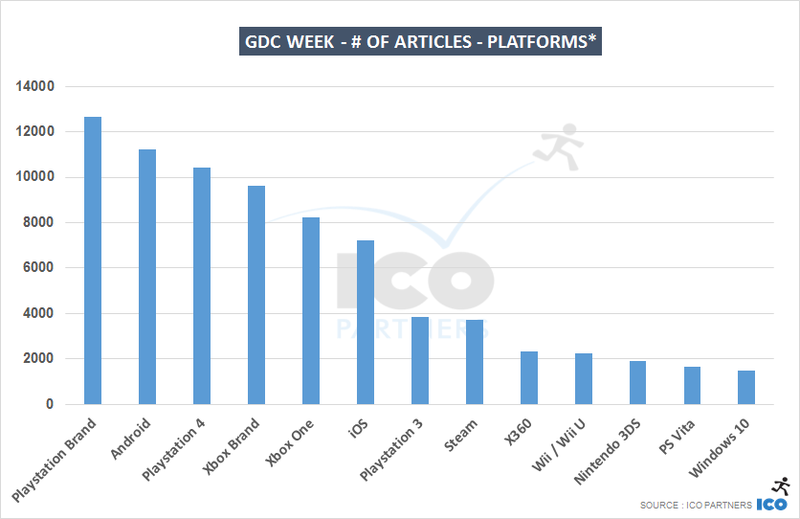 The GDC tracker was set in July last year, so I don’t really have any previous data I can compare properly. Next year will certainly be different, but for now I have compared GDC to gamescom and the Playstation Experience (especially as I already had some research ready from this post on Playstation Experience). In many ways, it is not really fair as GDC is not as media and announcement-focused as the other two, who are specifically built around getting the word about games to their audience. It does give some sense of the respective media these events get though. 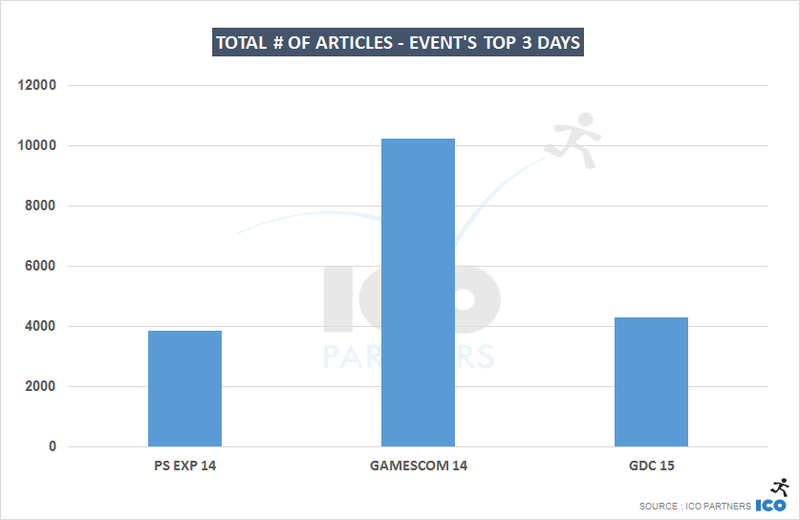 So, strictly in terms of media coverage, GDC in the same range as the Playstation Experience event, and with about 40% of the coverage gamescom generates over its peak 3 days. 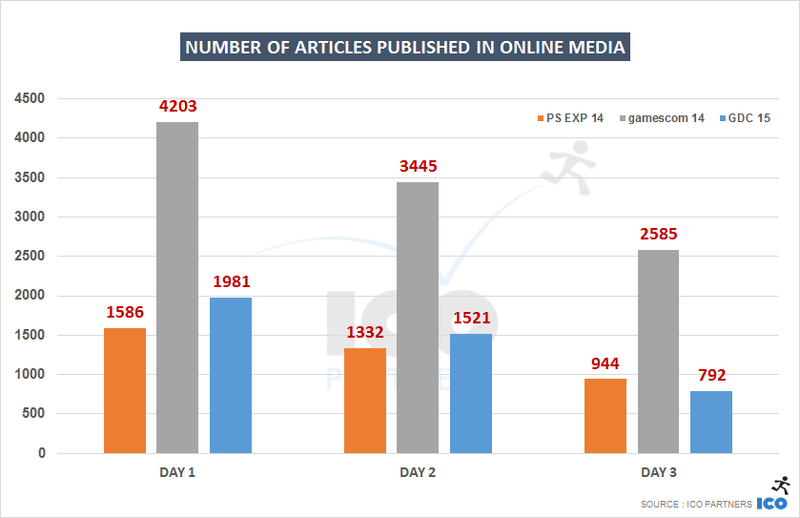 As we have seen in past media coverage analysis, PlayStation is keeping its lead on Xbox, but that is actually smaller than the average observed over the course of last year (about 36% more articles for Playstation on average over the last year, against 31% more articles during the week of the GDC). Microsoft made more game-related announcements while the Virtual Reality HMD for Playstation helped in keeping Sony in the news. Android’s strong presence in the media is due to the Barcelona Mobile World Congress, where a number of mobile manufacturers announce their new devices. One of the most discussed announcements during GDC was, interestingly, *not* made at GDC. Instead it was at the Barcelona Mobile World Congress where on the 1st of March, HTC announced its VR HMD in partnership with Valve. Clearly, the HTC/Valve announcement has been the most talked about VR news for the week. 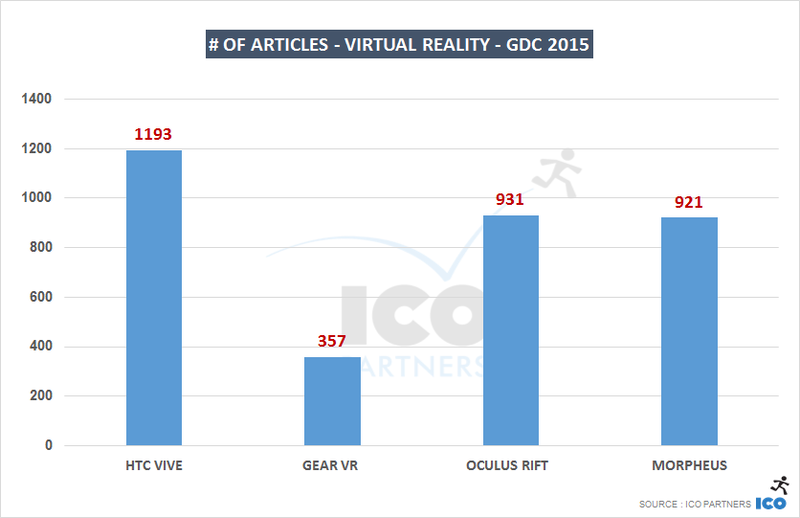 It is also incredibly impressive that both Morpheus and Oculus managed to keep such a high media presence with announcements were not as strong. Both were frequently mentioned in relation to the HTC Vive though, often compared to it or just referenced as much more established brand associated to VR. The other very hot topic during the GDC week was the numerous announcements related to the off-the-shelf game engine offerings. With Valve now joining the fray with their Source 2 engine. To be fair, there are many ways to measure victory, and Unity’s booth was very crowded all week long. I am not suggesting that Unity has had a bad GDC by any stretch of the imagination. That said, I think Unreal is showing its longer experience in handling media and announcements, as well as the fact that it is a much more established brand for engine. 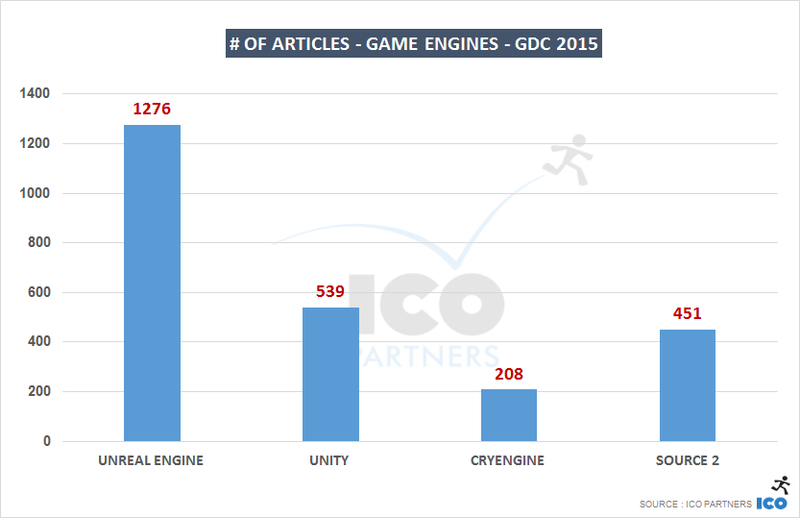 Unity being a common word, I suspect it explains a lot of the ongoing search results associated with the game engine. But the much bigger bump seen in searches for Unreal Engine over that period (10 times more searches) in comparison to the Unity bump (25%) seems to indicate that at least that one battle was won by Unreal.